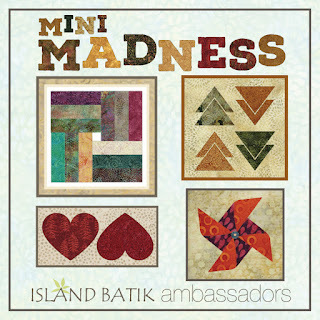 PamelaQuilts: Mini Madness - Island Batik and Aurifil spools! Mini Madness - Island Batik and Aurifil spools! 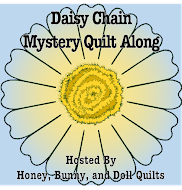 I was very delighted that our March challenge was Miniature quilts because I do love making miniatures! I can remember loving small things even as a child - making dollhouses out of cardboard boxes and filling them with furniture. I remember a neighbor lady showed me how to make a fabulous chair out of a soup can one day. My favorite doll was a 6 inch high Dawn doll and since I was getting interested in sewing I had tons of ideas for making her outfits! My friends and I liked collecting the small troll dolls as well - but they were a little harder to dress. Those squatty bodies always looked funny in everything we made! I'm still very delighted by tiny things and making mini quilts is just fun for me. For this challenge I was all set to make a quilt from the Carol Doak Miniature book, but then when I was blog-reading I found the Sew Many Colors pattern and changed my mind. I'm trying to think of some basketball analogies, but nothing fits! I guess I'll have to go with baseball - it's a home run - a mini quilt, made out of Island Batik and Aurifil thread. Three of my favorite things. I love the stripey green! Perfect for a spool of thread, don't you think? Before I knew it, I had the whole quilt pieced! Now to decide how to quilt it! I decided to do an all over grid. I really didn't want to mess with marking it, so I decided that I could probably eyeball 1/2 inch spacing and started stitching! I would stitch three lines to the right of the last line, then turn the quilt, and stitch 3 lines on the next side. I had to do a little adjusting when I got near the edge, but it really doesn't show much. Trim, add binding, and my quilt is finished! I love it to death! In fact, I plan on rearranging my mini wall to make the perfect place to feature this quilt! Sew Cute! I love foundation paper piecing with Island Batik fabrics! They press perfectly and are so easy to work with. And the colors - always beautiful! I also used Aurifil 50 weight thread for the piecing and quilting of this quilt, I love the subtle look of quilting with it, and it's perfect for tiny seams because it lays so flat, even with the stitch length shortened for the foundation piecing. I ordered it and used it to make this quilt, and it was super great! It is so nice to have this one tool that you can use to fold your paper over, then make your cut with the ruler part. Plus it can be used to cut 1/8 inch seams as well! There is a bit of a learning curve with the cutting because of the thickness. You do have to make sure to hold your rotary cutter straight and not angle the blade, because that will give you wonky cuts. But I do love it, and probably will order the 12 inch quide soon. The 8 inch guide was just barely big enough for some of the pieces in this quilt because of the weird angles. The second thing I tried for the first time is June Tailor Foundation sheets. They are a little spendy, but I really wanted something lighter than regular computer paper for this project. I really did like using these sheets. They are lightweight, you can see through them, which is very helpful, and they tear off easily. I was skeptical about running them through my printer because they are so thin and kind of slippery, but they printed perfectly. The package of 25 sheets will last me a while since I don't do a lot of paper piecing. I was glad I had a good coupon to use, and it was nice not to have to wait for something to be shipped, so it was definitely convenient for me to be able to go pick them up at JoAnn's and start sewing right away. Do you like making mini quilts? Even if you don't like making them, surely you love seeing them! 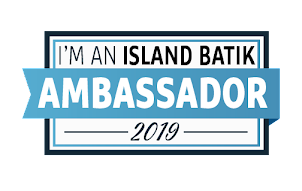 Here is the list of Island Batik Ambassadors - you will love their Mini Madness posts, too. I am linked up with Myra of BusyHandsQuilts for Finished or Not Friday as well - lots of fun projects, come join in! You know I love it! Great job and a very interesting ruler!